« CDC cuts to lead to prophesied epidemics? President Donald Trump signed into law, a six-year extension of the Foreign Intelligence Surveillance Act (FISA). for those rightfully worried about privacy and government surveillance, you can adopt NordVPN, a reliable virtual private network service. With changes in laws around the world, combined with private internet companies, and a desire by governments to monitor everything, we are getting closer to what amounts to about a total surveillance police state. As far as having a VPN goes, that could possibly help some now. But that is not a long-term solution. Imagine a society in which you are rated by the government on your trustworthiness. Your “citizen score” follows you wherever you go. A high score allows you access to faster internet service or a fast-tracked visa to Europe. If you make political posts online without a permit, or question or contradict the government’s official narrative on current events, however, your score decreases. To calculate the score, private companies working with your government constantly trawl through vast amounts of your social media and online shopping data.When you step outside your door, your actions in the physical world are also swept into the dragnet: The government gathers an enormous collection of information through the video cameras placed on your street and all over your city. If you commit a crime—or simply jaywalk—facial recognition algorithms will match video footage of your face to your photo in a national ID database. It won’t be long before the police show up at your door. Do not think that places like Europe will not have this type of ability. Europe has already pressured private internet companies like Google and Facebook to take down potentially disturbing content from individuals. 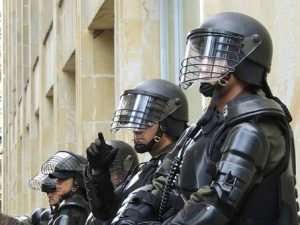 As far as loss of liberty goes, an article titled ENTERING THE AGE OF TERROR in the old Plain Truth magazine in June 1977 said that as a response to terrorism we may see “that the inevitable result would be a repressive, authoritarian police state and the loss of civil liberties.” This has been occurring. The anti-constitutional Patriot Act and other laws have essentially taken away privacy rights any time the government feels like it. As far as a ‘police state’ goes, this is something that Church of God writers have expected for some time. World government … totalitarian state of the worst magnitude. As the Wall Street Journal put it some years ago: “It follows that for a world government to be effective, it would have to possess powers of compulsion undreamed-of in history’s worst nightmares …. No matter who were the magistrates of the world-state, they would have to trample on so many national and individual aspirations and attitudes, would have to deploy such an army of enforcers, that the most probable upshot would be a police-state on a colossal scale …” (Wall Street Journal editorials, November 14, 1963 and September 14, 1965). A surveillance police state is coming. And now, the technology exists. The end result will be bad. It will arise in Europe. Europe will get together because of fear, economic factors, and a distrust of the USA for military protection and other reasons. It will take some type of surveillance state to fulfill Amos 8:11-12. It is likely that, although the USA is NOT the Beast of the Sea nor the Beast of the Earth in Revelation 13, some in the USA may well help the Beast get Amos 8:11-12 fulfilled (this would seem to be hinted in Daniel 11:28-30; see also Preparing for the ‘Short Work’ and The Famine of the Word). The world in general and Europe in particular is moving more and more towards becoming a totalitarian state. The USA is also moving towards being a totalitarian state. At least enough that, for a time, it is likely that it will cooperate with the Beast to help fulfill Amos 8:11-12. And, that will not end up helping the USA as that state will turn against it per Daniel 11:39 (see also USA in Prophecy: The Strongest Fortresses). This entry was posted on Monday, February 5th, 2018 at 3:30 pm	and is filed under Prophecy. ‘China surveillance firm tracking millions in Xinjiang’ Can it happen to you?